Some things in life are just too good to turn down. Moving to Japan? Aye, alright. Seeing your favourite band play your favourite album in your new hometown? Go on then. Eating a lamb kebab after living in a country where lamb seems practically impossible to source? I can’t remember the last time I ate a kebab sober. Usually, I consume a doner kebab smothered in ‘salad’ (the sawdust-esque shredded cabbage) and ‘sauce’ (I’m not even going to speculate) at the end of a drunken night, splitting the leftovers 50/50 between my shirt and the nearest bin. 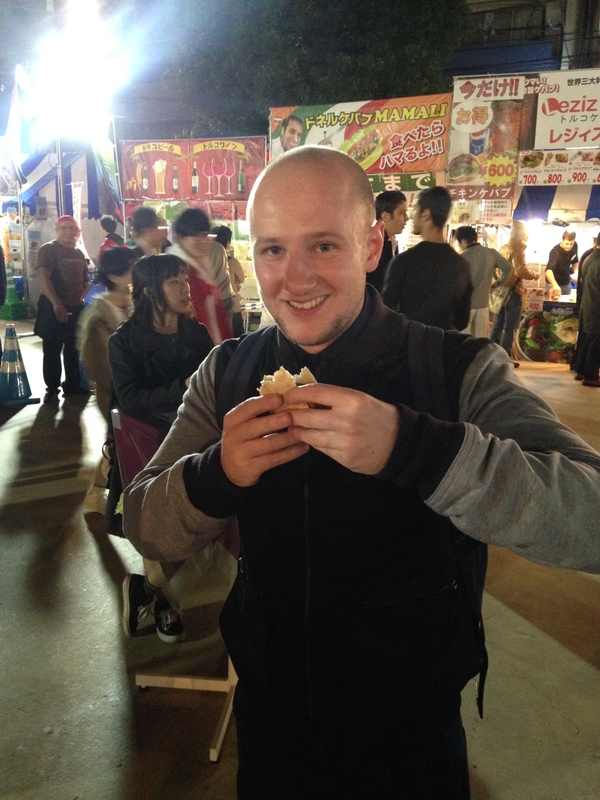 Kebab in hand. No sauce on the jacket…yet. On the train to work one day last week, however, I noticed an advert for an event called the ‘Kebab Grand Prix’ in Shinjuku. Intrigued by what the hell this could possibly be I decided to dig a little deeper. 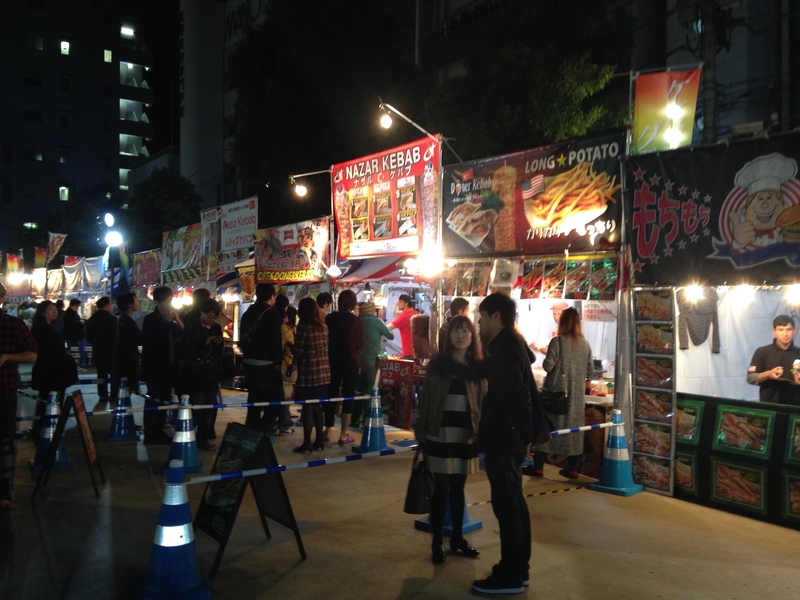 Although it wasn’t a race between a bunch of late-night kebab vans round the streets of Tokyo (much to my disappointment), a competition to crown Tokyo’s best kebab wasn’t a bad alternative! And so it transpired that chowing down a kebab was to be a pre-drinking activity instead of a post-drink one, as I met two of my friends after work to set about sampling the finest kebabs Tokyo has to offer. The ‘Grand Prix’ was held in Okubo Park Theatre Park, which was rather interesting in itself as it didn’t appear to be a park – more a tarmacked car park-looking thing with a fence around it. Tomayto tomato. Not a Grand Prix, and not a park. Upon entry we were greeted by something I’ve not yet experienced in Tokyo: hawkers. Unlike a lot of Asian countries, in Japan they seem quite happy to let you get on with things and make your own choices. However the hard sell was very much in force here, as wherever we turned we were greeted by Turkish looking blokes trying to convince us that they sold the best kebab in Tokyo. The first port of call was a drinks stall, where we purchased a few ¥700 bottles of Efes whilst mulling over our choices. It was here that we were introduced to the rather bizarre concept of handing over our cash for ¥100 tokens, before handing the tokens over to the vendor who was stood just a couple of yards away in exchange for our beers. Bureaucracy at its finest. 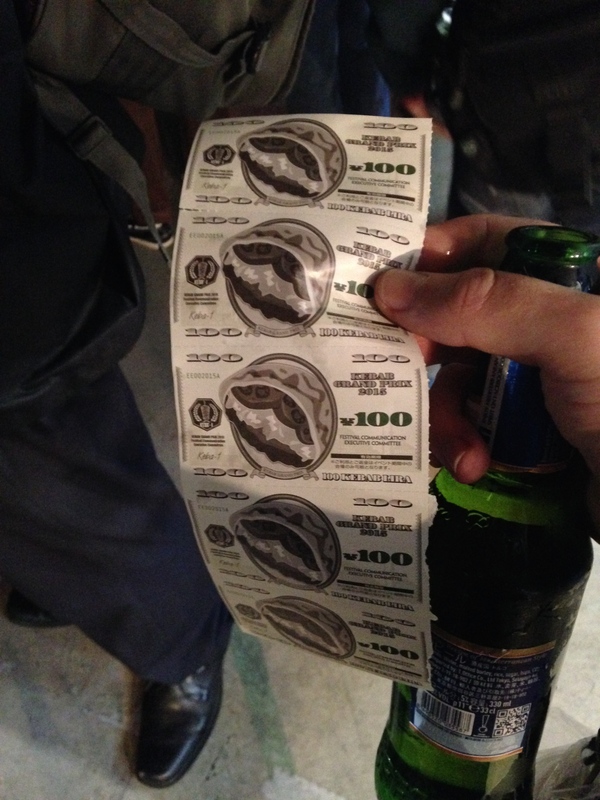 I’ve heard money referred to as beer tokens before, but here are some actual beer/kebab tokens! We were faced with something of a dilemma here; some of the stalls had considerably longer queues than others. Now this would usually be a good sign, but in this case we wondered whether it was just a sign of a good salesman. After some careful consideration (and a few minutes of distraction courtesy of the belly dancing taking place on stage), we were lured in by a guy promising the best garlic sauce in Tokyo. It really doesn’t take much. Two of us opted from the lamb kofta kebab, whilst the other member of the party went for the doner kebab. 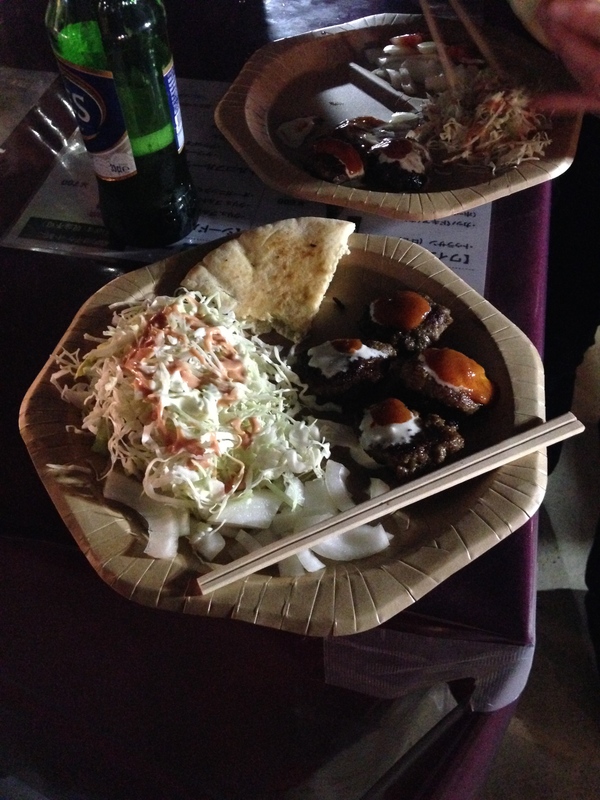 The garlic sauce was indeed delicious – as were the koftas – but I did have one complaint: it wasn’t really a kebab. In a kebab making competition, I think that’s worthy of a few points being knocked off. Take a look at the picture and decide for yourself. Is this really a kebab? To me, a kebab needs more than just a quarter of a pita bread to pass as a kebab. Maybe I’ve been spoilt/ruined by the greasy takeaways I frequent back in the UK, but being able to actually put the filling in the bread is kind of a big deal for me. That said, taste-wise it ticked a lot of boxes, although 24 hours later I can still taste the raw onions every time I burp. Too much info? Despite being tasty, it didn’t really fill us up so in the end we also opted for a portion of ‘long potatoes’ or, as I suspected, ‘big chips’. 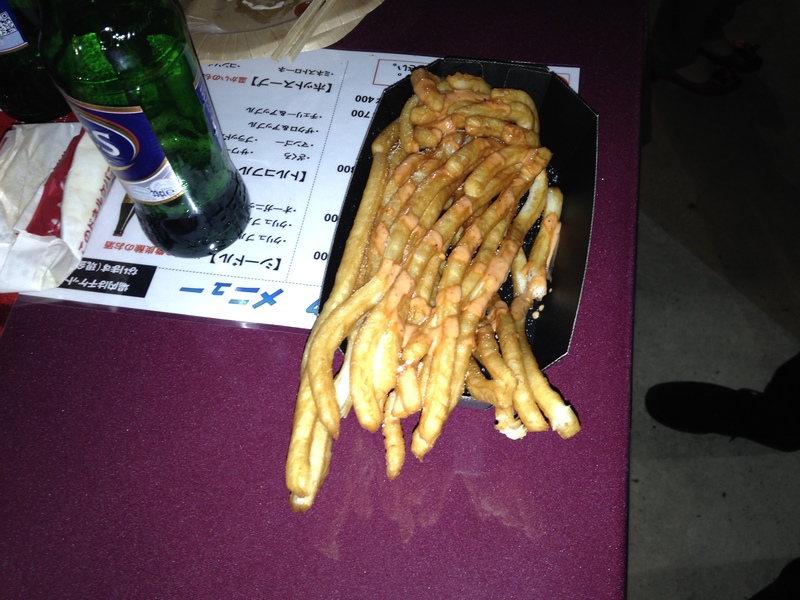 These were a rather bizarre creation, as they were essentially chips, but they had a slightly hollow feeling to them. Very odd indeed. Long potatoes, or big chips? With our cravings satisfied, we stuck around just long enough for the winners to be announced. Truth be told, we were none the wiser as to who actually received the prestigious ‘Best Kebab in Tokyo’ crown, but we were fairly sure it wasn’t our guy.